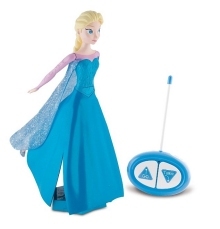 One of the must have toys for Christmas 2015, the Remote Control Skating Elsa doll from the film Frozen is currently in short supply throughout the UK. We constantly track for stock which ensures you will be the first to know when availability is found. With the Disney Frozen Skate & Sing Remote Controlled Elsa Figure act out the magical scene from the film with Elsa ice skating while singing the 'Let it go' tune. A must have toy for all Elsa fans this Christmas 2015 enabling your little one to join Elsa in her special moment. The remote control is specially shaped and sized so that it is easy for little hands to use. Works up to a maximum of 10 metres away for 3 hours. 3 x AAA Batteries and 1 x 9V Battery required which are included. We constantly check for Skate and Sing Elsa stock, so you don't have to. 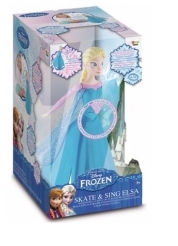 Receive email alerts when Skate and Sing Elsa online stock is found.